... The Solway Frith, into which the Eden flows, divides Cumberland from the Scotch county of Dumfries. Solway Frith or Eden R.
Below this Burgh [by Sands], in the frith itself, the inhabitants say the Scots and English fleets engaged, and, on the retreat of the tide their cavalry, which seems as extraordinary as what Pliny relates with astonishment of a similar place in Caramania. This frith is called Solway frith by both nations from Solway a Scotch town on it. But Ptolemy more properly calls it ITUNA. For the noble river Eiden, which waters Westmoreland and the inner parts of this county, pours the largest quantity of water into it, still mindful of the obstruction it met with from the heaps of Scottish bodies in 1216 drowned in it in their return from England loaded with spoil, when it whelmed that band of marauders in its stream. ... [Solway Frith] ... Ptolemy more properly calls it ITUNA. For the noble river Eiden, which waters Westmoreland and the inner parts of this county, pours the largest quantity of water into it, still mindful of the obstruction it met with from the heaps of Scottish bodies in 1216 drowned in it in their return from England loaded with spoil, when it whelmed that band of marauders in its stream. A description of the Tides, Rocks, Shoals, and Anchoring-places, in the MOUTH OF SOLWAY FIRTH. Time of high-water. / In the mouth of Solway Firth, both on the English and Scotch side, it is high-water on the full and change days of the moon at eleven o'clock. Rise of the Tide. / Spring-tides rise twenty feet perpendicular; neap-tides eleven or twelve feet. Velocity of the Stream. / Spring-tides near Burrow Head, in Scotland, run about three miles an hour when strongest; neap-tides one. In other parts of the coast, included in this draft, the stream is not so strong. Direction of the Stream. / The principal stream of flood that fills Solway Firth, comes from the N.W. between the Mule of Cantire and Ireland; part of which runs along the Mule of Galloway, and from thence up Solway Firth. ROCKS and SHOALS. 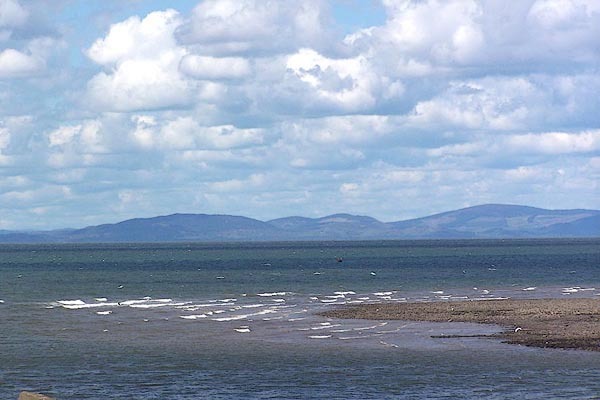 / There are no rocks or shoals in the mouth of Solway Firth, excepting such as lie within the bays or harbours, and will be described with them, or may be seen distinctly in the draft. A Description of the Tides, Rocks, Shoals, Sand-banks, Channels, Anchoring-places, and Harbours in SOLWAY FIRTH. TIDES. / Tides in SOLWAY FIRTH. Time of High-water on the English side, and on the Scotch side. / It is high-water on the full and change days of the moon in Whitehaven, in Cumberland, at eleven o'clock; in Mary-Port at 11 1/2; at Bowness and Annan at twelve; at Saturness Point, in Scotland, at 11 1/4; in the harbour of Kirkcudbright at eleven. Rise of the Tide. / Spring-tides in Solway Firth, on both sides, rise about twenty feet perpendicular; neap-tides about twelve: off Carsthorn, near the mouth of the river Nith, spring-tide rises seventeen or eighteen feet perpendicular; near Saturness Point it rose twenty-four feet. Direction of the Stream. / The stream of flood, which fills Solway Firth, comes from the north-west, between the Mule of Cantire in Scotland and Rachlin Island in Ireland, and from thence runs along the Mule of Galloway up Solway Firth. Velocity of the Stream on the English side. / The stream along the shore, on the English side, between St. Bee's Head and Mary-Port, runs about two miles an hour when strongest; from Mary-Port to Skinburness, three miles; from Skinburness to Bowness, five or six miles an hour: neap-tides have about one-third of that velocity. Velocity on the Scotch side. / The stream on the Scotch side, between the Bay of Kirkcudbright and Barnhowry Bank, when strongest, runs about three miles an hour; along the Point of Saturness, it runs five miles; and in the channel off Annan about six miles. Caution in sailing along the S. side of Solway Firth. / No vessel should sail eastward in Solway Firth, on the English side, above Dubmill-swap, except between half-flood and high-water: for, if they happen to ground with ebb-tide on any Bank in the tide-way, the stream, particularly with spring tide, will wash away the sand from the ship's side so as to overset her. If a vessel is under any necessity of running a ground, it should be done, if possible, under shelter of some point, or bight on the shore, to break the strength of the stream; and not in a channel, or on a detached Bank. The like caution is necessary on the Scotch side above Carsthorn. [Solway Frith] now Eden R.
On the N.W. of Carlisle, there juts out a small Promontory, at the Point of which is the large Arm of the Sea, call'd Solway-Frith, or Hunae-Ostium i.e., the Mouth of the River Eden. It is, at present, the Boundary between England and Scotland, but anciently between the Roman Provinces and the Picts. ... Carlisle is strong by situation, being almost surrounded with rivers. On the east it has the River Potterell, on the north Eden, and on the south the Cande, or Canda, or Calda, which all fall into the arms of the sea, which they call the Solway, or Solway Firth. Solway Frith ot Itunae Flu now Eden R.
Sea more effect, coast shaded, foreshore sands. generic label for the many sandbanks? Prima Europe tabula, Europe Map 1, Ptolemy map of roman Britain, by Gerard Mercator, 1578. Map, Albion et Hibernia Britannicae Insulae, from the data of Claudius Ptolemy, 2nd century, on the example of Gerard Mercator, 16th century, scale about 55 miles to 1 inch, engraved by Basire, published for the Society of Antiquaries, 1793. Print, Solway Wildfowler, by Joseph W Simpson, 1925-29. Half length depiction of a wildfowler, middle aged, facing left, his head turned to regard the viewer. He wears waterproofs and rests a rifle under his left arm. He is seen against a background of flat marshland. Painting, watercolour, The Solway looking towards Scotland, perhaps at Allonby or Port Carlisle? Cumberland, by William James Blacklock, 1850-58? Painting, oil painting, The Packet Boat Cumberland; A Storm on the Firth, Solway Firth off Cumberland, by Joseph Heard, about 1840. A packet boat is tossed upon a stormy sea, its sails furled. The silvery glow of a full moon illuminates the troughs of the waves. Part of the boat's cargo of sacks has been swept overboard and floats beside and behind it. Print, uncoloured engraving, The Solway from Harrington Harbour, Cumberland, drawn by W H Bartlett, engraved by R Brandard, published by George Virtue, 26 Ivy Lane, London, 1841. W. H. Bartlett. / R. Brandard. / THE SOLWAY / (from Harrington Harbour.) / London: Published for the Proprietors, by Geo: Virtue, 26, Ivy Lane, 1841. Haaf netting is a norwegian way of fishing for salmon and sea trout. The fisherman stands in the flooding tide with the large square nets on a pole framework. When a fish enters the nets the fisherman heaves the net over the pole to trap the fish. hearsay Alexander II King of Scotland crossed the Solway by a 'wath', a ford, in 1216, after a raid into Cumberland. He was caught by a flood tide, and 1900 of his men were drowned.